The first Saturday of my Summer Vacation from teaching kindergarten, I fell hard on my tailbone and was confined to the soft couch and unending pain for nearly 6 weeks. I made the most out of it by working on some crafts and projects. Have you ever crocheted till your hand went numb! LOL! Even though I could barely sit - I could walk! So, sweet hubs took me to yard sales each weekend. He drove very nicely over bumps, too. I was able to add to my Pyrex collection. I made some pillow slips for 4th of July. I found this idea on Pinterest. Don't you just love Pinterest? I didn't sew them up till later, when my bottom felt better. LOL! This project gave me a way to use up some yo-yo's. I had saved a sweet blog photo of a lovely pillow that someone had made. It was my inspiration for this papercrafted piece. I watercolored my stems and leaves, but the origonal pillow was all hand stitched. It was so pretty. My friend Ann cross-stitched the cherry towel for me. The bluebird teatowel came from a local yard sale. I just LOVE these prettys! 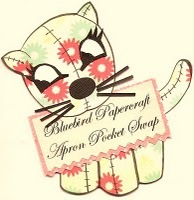 I ordered a sweet towel from Heather at Vintage Grey Handmade. She wrapped it so sweetly, and added a strawberry. Yummy! I found this little slipcovered chair at the Thift Store. She looks pretty with Heather's teatowel! I made a zillion papercrafts this summer. I ate cherries every day! And hubs made iced coffees. I remade this sweet print I found at a yard sale for $1. My Cricut cut a perfect circle. When I felt better we had nightly swims in our pool. We spent time with the grandkids! My brother in law, Dave, turned 50! It was a hot summer and I hardly ever cooked on the stove. Instead, Hubs grilled nearly every night! He didn't burn it once! Hubs and I celebrated our 35th wedding anniversary. Seems like yesterday we "got hitched". My wedding dress still hangs on the bedroom wall. So many years, so many struggles. So many blessings, too. More later - thank you for visiting my blog. "Rejoice in the Lord always. I will say it again Rejoice!"